Height: 6' 0", Weight: 220 lb. 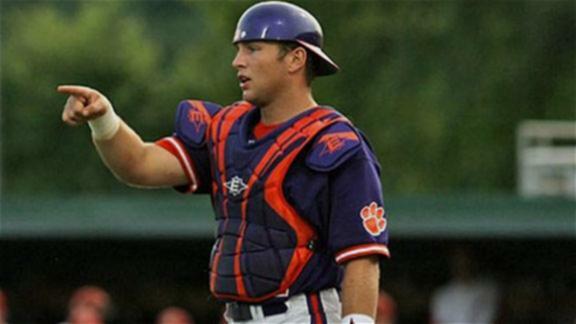 Drafted by the Washington Nationals in the 5th round of the 2012 MLB June Amateur Draft from Clemson University (Clemson, SC). Currently playing at Hagerstown where through 62 games / 242 PAs he's put up a .331 / .359 / .525 slash line with 6HRs and 2 SBs. Reports are that he's got a short, compact swing, and is someone to keep an eye on. His ascension could be a large part of the reason why the Nats left Adrian Nieto unprotected in last year's Rule 5 draft. He had TJ in early 2013 and appears to be fully recovered. Spencer Kieboom, C: Advanced approach for Low-A ball, but old for the level; starts with a slightly open stance and good rhythm at the plate; swing path is flat and has average bat speed; does a nice job of using the whole field and understands how to drive the opposite field (RCF) gap; some pitch recognition issues with changeups and is extremely aggressive at the plate, which could get him into trouble; front foot bails out slightly which can give him issues on fastballs on the outer half; defensively sound behind the plate with a strong arm; threw a runner out from his knees; has some work pitch recognition and plate discipline but it’s an interesting combination of bat-to-ball skills and arm strength for a catcher. Spencer Kieboom, C, Nationals (Hagerstown, A-): 2-5, R, 2B, HR, K. With a tremendously great name, it’s easy to like Kieboom, but he also has a few things to offer that aren’t on the back of his jersey. The free-swinging Kieboom will get himself out a lot, but when he makes contact, he features better power potential than most catchers. He’s still learning how to drive the ball over the fence with regularity, but the doubles power is legitimate and could be a sign of things to come. He's old age wise but not baseball wise. Drafted in 2012 then missing all but a couple of games due to UCL replacement last year puts him on track in the Sally League. What is his actual nickname? We can play around with "Boom Boom" or "Goes the dynamite,"or rif on his first name and call him Spencer for Hire, but I'm guessing this guy has a nickname already. It would be cool if his nickname wasn't based on his name, and it was something like Death Grip. Those numbers aren't far off of what Molina is putting up this year, and they blow away Norris. A AA catcher cannot seriously be compared to a guy in the majors... You're joking? While a bat's not the end all, be all for a catcher, he was never really known to be a strong defensive catcher, so there's that. He's on the 40-man still. He'll get the call in Sept. if he's healthy. Usually you have a 4th catcher on the 40man just in case one gets hurt. I dont think he will get the call. Probably only see Severino. Nah, everyone on the 40-man that's healthy gets the call in Sept., even if they don't play. Doesn't make any sense not to. Could be an important competition for backup C next year, since Loby is awful. just pointing out his offensive numbers aren't terrible. I haven't seen him since last year at Potomac where IIRC he batted clean-up, I don't know how the club views his defensive skills. He's 25 though, so definitely short on time. Sure, if they translated to the majors exactly the same. If so, then it's passable, especially with great defensive skills like Molina. Not sure why it hasn't caught up with catchers (as far as young guys coming up earlier), but 25 isn't that late as a C prospect. You'd hope he's feeling out how to handle pitchers (Giolito and him are best buds -- not that means anything for on-field performance, but who knows), and getting a shot to sit next to Ramos/Loby/BP catchers for a month in Sept. is a huge plus. definitely. there's no downside to calling him up except for making the clubhouse and dugout more crowded. Backup or starter? We'll need a starter for sure. There is also burning an option. Severiono might get the nod. If on 40 only, right? Right and you can only play that game for 3 years. Got it. .227/.310/.314 in 255 ABs now. Any chance he gets to play?